The next two posts are specifically for all of you out there with children who are really active and need to be moving around (like my child!). One of the things about My Obstacle Course that has made such a huge difference for us is the fact that the activity stations are not long, drawn out, “sit here for an hour” things. They are quick, to the point and then move on, which is why the activities I show you are also quick and easy to make! Holy Cow! Where Is All Of This Energy Coming From And Where Can I Get Some? Andrew is very active and is known to run in place kicking his bottom (which probably also explains why he’s all muscle and no fat – must try this myself!) so when I would try to get him to sit and work with me at the counter or table – miserable failure! By using the obstacle course structure with numbered stations set around the room, we were literally moving from thing to thing but in a structured and systematic way. Since it was an adventure, engaging with me became much more appealing, especially since there was very little if any that required him to sit on a chair. There were stations I set up around the kitchen table and actually removed the chairs so he could focus on the activity and not on falling off of or squirming around the seat. Having been a teacher, I know there is a time and place for working on this skill, but my main goal as his mom was to find a way to engage with him. I’m writing this now because for the next few weeks these active children will be at home with us and instead of fighting the energy, I encourage you to set up your own Obstacle Course and use some of these activities to put that energy to use in a strategic and purposeful way. If you have an active child, you probably already have toys that can be incorporated into stations that can help burn some energy while also building academic skills. Here are some things I have used in My Obstacle Courses and how have I have used them. The mini-trampoline has been quite a life-saver for us. 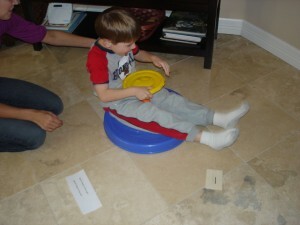 It allows Andrew to be bouncing and getting sensory feedback while keeping his body in one location. 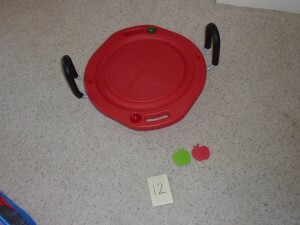 I began including it as My Obstacle Course stations to work on his counting by counting as he jumped. We have counted by ones, fives and tens. The next thing we will try is counting by twos! 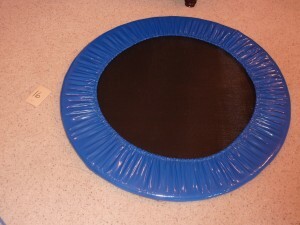 We also use the mini-trampoline to help work on all of the motor planning involved with jumping jacks. Getting the feet out and hands up together and then hands by his side with feet together has been quite a challenge but it’s a fascinating process to watch because it is clearly a brain planning issue. This is something I do with him so he gets the visual cues for imitation. When we begin this activity, we only do one half of the body (top or bottom) at a time. We jump together, focused only on moving feet out and in. Then we only do our arms – down by our sides and then up over our heads. After practicing those motions, both parts are put together and if he is not successful, no worries, we just try again another day! I have said this before and will say it again, spinning is Andrew’s thing! Just look at his face in the picture above, anything to do with spinning brings him joy and is obviously something that his body needs. 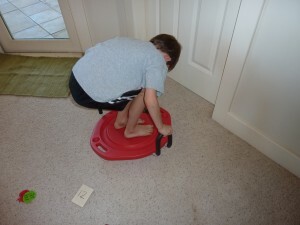 When searching around for things to include in My Obstacle Course, I saw the sit and spin in our closet and thought that this toy would be a great way to combine spinning with counting and following directions. Sometimes we count by ones and he has to spin one direction a certain number of times and the other way a certain number of times. Other times we count by fives or tens to a given number and then we count backwards when going the other direction. 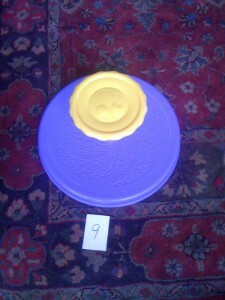 My Obstacle Course Station Idea: Balance and roll a ball a given number of times. We got this as a gift one year but didn’t use it very much. I decided to use it as a station activity to build not only his balance but also motor planning because he had to balance and move so that the ball would go around the ridge a certain number of times. It became much more fun once it had a purpose and he has since become quite skilled at getting the ball to go around quickly while not having it fly out of the track! 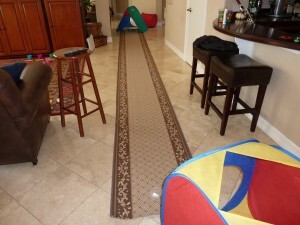 Carpet runner used for "Crawl and Match"
In my post about tunnels I wrote about my desire to increase the crawling Andrew was doing. Getting both sides of his body moving together meant getting both sides of his brain working together, creating connections. I scatter the collapsible tunnels I have throughout My Obstacle Courses but also wanted a way to get more continual crawling. I found this remnant carpet runner at Lowes and thought it would make a great location for crawling. Now, Andrew isn’t just going to crawl because I have a fancy carpet runner on the floor. Like most things with him (and he’s not unlike most people I know), he needed to see the purpose in doing this. Explaining to him that crawling would help his brain make connections wasn’t going to do anything and I knew I needed something clever. 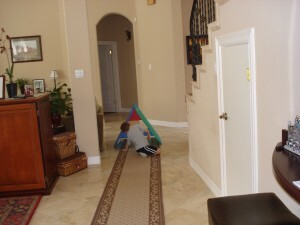 I decided to incorporate a sorting or matching activity with the carpet runner, calling it “Crawl and Match” or “Crawl and Sort” and he would start at one end, grab an item or card to sort or match after crawling down to the other end. It was something that we both had to do at first and at times I would crawl almost on top of him but it worked and he was very excited about seeing what sort of thing he would be doing – matching up word parts, sorting addition equations by their sum, sorting words into rhyming families, etc. If you have little ones, it could be as easy as sorting items by shape, color or function. See, even I have forgotten that I am supposed to be writing about crawling on the carpet runner instead of the activities that are part of the station (I will definitely do a post soon on all of the variations I have come up with for these two games!). Funny how your mind focuses on things it finds interesting and fun – guess the apple didn’t fall too far from the tree here in this house!! The same thing happens with Andrew and while he’s focused on what he likes (words, clues, numbers) the crawling just becomes part of the activity at this station.